'Walking Dead' Season 4 2014 Poster: Don't Look Back! New ‘The Walking Dead’ 2014 Poster: Don’t Look Back, Carl! 'The Walking Dead' remains just out of our reach with a February 9 premiere of season 4's latest, but that shouldn't stand in the way of some fresh new art from the zombie apocalypse! AMC has released a new season 4 poster that teases Rick and Carl on the road ahead, but how long will the pair remain isolated from the other survivors? 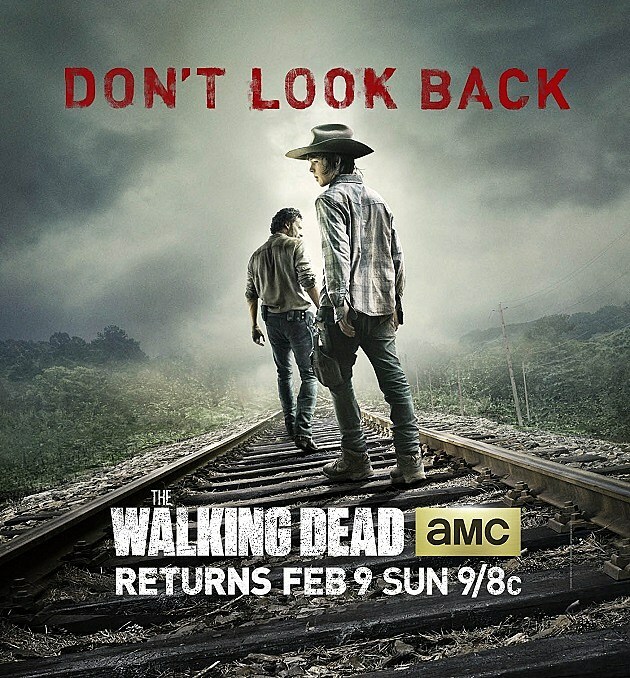 Captioned with the ominous warning "Don't Look Back," the ominous new poster for 'The Walking Dead' season 4 sees Rick and Carl walking down a set of train tracks toward an unknown future, having been displaced from their prison home in midseason 4 finale "Too Far Gone." The most recent trailer definitely promised Carl (Chandler Riggs) a bit of spotlight as well, given that Rick likely needs a bit more recovery time from his injuries. In the meantime, take a look at the long road ahead for 'The Walking Dead' season 4 in the tense new poster below, and give us your predictions for the AMC horror drama's February 2014 return!